We don't often get a critical mass of EqD staff out to a pony convention these days, so it's cool when we can in order to bring you these face-encounters with the people who work on the show. Nick Confalone joined the MLP writing stable on Season 5 with "Party Pooped" and "Hearthbreakers", followed on hot with "No Second Prances", "Saddle Row Review", and "Dungeons and Discords" in Season 6. Couch: Thanks for joining us, Nick! Tell us about yourself! Where you come from, your influences, how you got involved with My Little Pony. Nick: [smiles] That's a very big question! I was born in Delaware (and there's no sales tax there! (that's a fun Delaware fact (you should put that in))), and I grew up making movies with my dad's camera. He was very generous considering that it was, you know, a high-end, top-of-the-line camera -- let his kid play with it all the time. I would make movies with G.I. Joe, Thundercats, and Voltron toys, sort of like an audio-visual version of fanfiction? C: Godzilla in there, too? N: Yep, Godzilla! My dog was Godzilla at times. And then I went to college; I was pre-med, and there was this push-and-pull: do I become a doctor, or do I just keep making movies and letting down my entire family? So when I graduated, I came out to L.A., and I had this MCAT study guide. I was like, "I'll take the MCATs in six months, and I'm gonna try to be an assistant for a while." And then that led to an assistant job at Disney, and when I started working in animation I was like, "I LOVE THIS." That school thing, uh, kinda went by the wayside. Every now and then I'll get my dad going "Are you sure? You know, Penn is really close to home! Could go to med school, become a doctor." And I'm like, "I'm okay! It's fine! N: I'm like, "Dad, I have a job!" They don't understand that this is work. [chuckles] He's like "But you draw cartoons! You don't--" "I don't even draw cartoons!" C: Before we jump into pony, I'd like to shed some light onto some other things you've worked on! Take, uh, Future Worm. C: [lacking all tact] I haven't seen it. I'm sorry. I'd like to, though! From what I gather, you wrote more episodes for it than you did for MLP, and that it's more of a staff writer-focused experience than the pony freelance job. Tell me about your involvement on Future Worm and what you like about it! N: And I wish -- I mean, I think every single season, there's sort of a rumbling at Hasbro like, "Is it time? Are we gonna get a staff?" And then they never do. [poker face] I think it's a lot cheaper to go freelance. It'd be way more fun if we were staff. C: They'd have to pay for more than a closet for you guys to meet in! N: You know! When I broke "Party Pooped" with Mitch [Larson], he was the story editor at the time, he didn't have an office. We had to go to a boiler room, and he had a whiteboard where he was like [pantomiming a whiteboard being dragged from behind a tangle of pipes] all wiggly-wiggly, set it up in this boiler room and we sat there with pipes and stuff when we broke the story. [cracking up] Like, "Guys, this is the, what? Fifth season? This show is a success! Can you give us an office?" C: This is your first horse convention. C: Probably your first convention ever where you're a guest of honor. C: Okay, talk about that! N: Oh my God. So okay, just for a second, when [my handler] Alex was waiting at the airport with a sign that had my name on it, I was like "It's happening! It's happening! !~ I even got a sign! That's me!" And it's just been amazing. I feel like it's really special to be in a place where everyone really wants to be here. Know what I mean? You can really feel that vibe. Everyone's come from all over the place and everyone is so excited to be here and be part of it. That kind of energy is really hard to find in the world and in normal life. I don't know. It's tactile. You can feel it. N: The green room and meet-and-greet is really fun! I have drink tickets, drinks for free! I got some cool presents, got as many chips as I want! Some other perks...? The writers' panel was really fun: I just did a two-man show with Mike Vogel on stage! N: [notices my scribbling] You have impeccable writing. N: Oh, nonono. I'm turning the tables, I'm interviewing you. Where did you learn to write like that? N: [full and total admiration] Oh, no way! N: This looks fake. It looks like a designer made it! N: You're like in a Wes Anderson film. C: S-something like that? Yeah, her writing's so much nicer and she even does watercolor sketches in 'em. I look at 'em and go, "this is art. I wanna do something like that." But this is your interview! N: Sorry! That was some razzle-dazzle. N: It doesn't take much longer than that. C: You worked for some random outfit called Fish Hooks. You were there along with other MLP alumni like Neal Dusedau and Meghan McCarthy. N: Mm-hmm. It was the three of us in the room, all day, every day. It was a board-driven show, so you don't write scripts. Our job was to talk about the stories, then only write a one-page outline. We basically hung out every single day just talking about fish, talking about our own embarrassing high school stories, hopes and figures and shame. That's how I got to know Meghan really well, and I remember [Editor's Note: In an abundance of caution, let's leave this off the written record]. C: Then you got to see them later, even if you're only freelancing for pony. N: That's how I got the job! I knew Mitch from Kick Buttowski, which was the very first thing I'd ever worked on, and he and I shared an office on that. So he was always like, "Pony's the greatest thing in the world! You gotta write for this thing!" I met with Meghan after Fish Hooks, and I was like "...do you...? Is there room for me if I had some ideas?" And she was like "Yeah, come on in!" And that was the best thing I ever did. I called her up and I was like "Are you still working on this thing?" And she said "I'm story editor, [now!]" ":D! Does that mean you can hire people?" [laughs] "Because I'm a people!" C: And now you're in with My Little Pony! Congratulations, you have the invisible weight of a fandom bearing upon your shoulders. N: [mock resignation] It's a lot of pressure. C: What did you do to prepare for writing for MLP? N: Um. Not as much as I should have, I believe. I feel like my first episode writing experience was really bumpy. We made some jokes at yesterday's panel about it, but the notes were pretty harsh! As they should have been: I was not on voice at first, and it's kind of hard to nail down -- the emotions are so important on this show, way more so than on other shows. It's part of the success of it, right? It has something it's about. Friendship is magic. Most shows, it's like "the boys fight the bad guys!" It's not about anything, you know? N: Exactly! Exactly. I watched every episode, but still! Getting that voice right, and finding the rhythm of it, I think, took a little while for me because I think I was writing at a faster pace than what the show was at first. My second one, "Hearthbreakers," breathes a lot more and feels better. But I'm also my own worst critic! Every time I watch an episode, I'm like, "Urgh, I would've changed this, I would've done that differently." C: Do you enjoy watching your own episodes? N: Mm-hmm! A lot. You know why? It's because the animation process takes so long. I'm seeing them a year and a half after I wrote them. I don't remember a lot of it, necessarily. I'll remember the big beats and some of the jokes I really liked. But seeing it -- it's like seeing it for the first time. And! DHX and [Big] Jim [Miller], they do so much incredible stuff. The boards are so amazing. There's a lot of jokes I wish I could be like "Yeah, I came up with that! [suddenly crestfallen] awww." 'Cause they're really, really good! C: Let's flash forward to the future. You're now writing "Saddle Row Review" with a few more episodes under your belt. It sounded like a challenge to write. 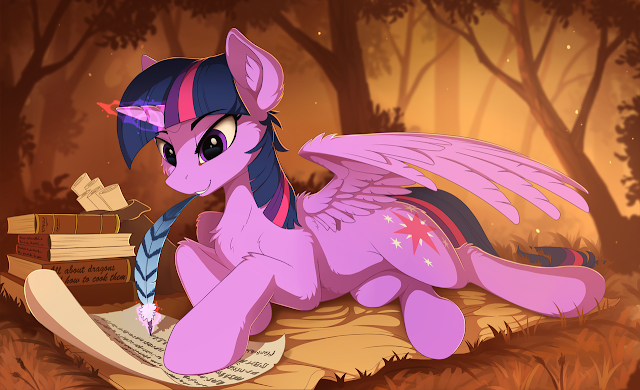 What changed between the first time you wrote a pony episode and when you wrote this one? N: I definitely got more comfortable with the characters. "Saddle Row Review" was so fun because... going back to my very first episode, a big part of why I think they kept me on the show was that I was willing to throw away everything and do a full page-one rewrite at every step if it wasn't working. There was no [nasally] "These are my words and they're precious." "Saddle Row Review" was the same way. We were trying to find an interesting way to tell a story about Rarity opening a shop. Pretty sure she opens a shop, has happened like three times already! I'm like, "How do we do this?" We had to throw everything away at each step because it wasn't working, it wasn't gelling. I think Meghan might have had the idea to try doing it like The Office, Parks and Recreation with the interviews as a framing device. There was this moment when writing a draft, we were all excited, we all got a laugh, and I remember going like "Yeah, they're not gonna let us do this." We're going to turn this in, but there's no way anyone'll say yes because this isn't the show. It was really hard to find a way on that one to make it the show. The very first draft had a lot of the same jokes, the framing, the cutaways, but it didn't have a good reason for them. I think that came really close to the end, which was "Okay, actually if it was an interview, and if it takes place afterwards and it's about Rarity reading it." Now it makes sense why we're doing it this way, which tied the whole thing with a bow. Without that, you're kind of just like "Why am I watching this stylized, weird thing?" C: Having been on the show for two seasons, with all the episodes you've watched and written, what makes "the show" for you? What makes a good "pony" episode? N: "Friendship is Magic." The best ones, to me, come from a really simple, identifiable friendship problem or lesson. If you can write a one-sentence friendship lesson, it goes such a long way for writing the episode 'cause you know where the target you're trying to hit is. Like, "Pinkie Pie learns blah blah blah." And then you go "Okay, I know that I can wander, I can be silly, but I'm going towards this emotional moment where there's a coming together, sort of like 'Oh my gosh, I realized this.'" And you go finish it off. C: And that whole one sentence summary that you come up with to define the end of an episode -- do you think that drives the episodes you find most enjoyable? N: Yeah, for sure! You can sum most of those up easily. I know for "Dungeons and Discords", that one went through a lot of revisions and turns of, when did they go to D&D world? How much of that happens around the table? But, written on the wall in big letters was "Discord learns to be humble about things he doesn't understand. That never changed, no matter what. C: Discord's a challenging character to write for. N: He's such a... can I say [BUY SOME APPLES]? [BUY MORE APPLES]? He's so chaotic! C: Those'll get bleeped out, don't worry. N: He's so chaotic, let's say that. He's so fun to write for, but then you have to rein him back in at the end. Or, you have to construct a story that reins him back in, or it'll feel forced. Luckily, it's all bluster. He's like Trixie. He's really insecure, deep down. When his feelings get hurt, that's when he becomes the Discord that we like to take out for a walk. At the end of the day, if you're nice to him and he realizes he made a mistake, he'll come around. C: Speaking of characters you like writing for, you mentioned your favorite character to write for is Maud Pie, and you introduced a really good Trixie in "No Second Prances". N: Yeah, that was really fun. Even the previous two Trixie episodes -- Chris Savino wrote the first one and it's so, so good, it's perfect -- what was really challenging with ["No Second Prances"] was: bringing her back, it wouldn't be interesting to have the same character come in, full of bravado, "hahaha!" and then leave at the end. It was a challenge to go "OK, why is she like this? Why does she do this?" and dig deeper. Especially for trying to find a way for her to become friends with Starlight. C: Have you seen the new season premiere? C: How do you think Trixie was handled? N: I loved it. I thought [those episodes] were both fantastic. But I know not everyone's seen them, so I don't wanna talk about them right now! But yeah -- I'm so happy. She's in the show! Yeah -- her evolution is so fun to watch. C: Let's wrap this up! What's the best or weirdest encounter you've had at BABScon? N: The best... was the weirdest! A guy came up to me and Mike Vogel, pretty early on, and was just like, [fedora] "Hello, gentlemen. I very much enjoyed this episode of yours and this episode of yours, and now I have some news that will devastate you. I don't think I can tell it to you. But, I must. I feel that I must." He then proceeded to tell us the episodes he hated the most! But in the most genuinely, matter-of-fact way, he just had to tell us. It was really, really fun. It actually precipitated a really good conversation and I think it's an interesting point. At the writers' panel, we would both much rather have an episode with a divisive, love/hate reaction that one that's just kind of all right. Comfy slice of life -- much more interesting when people get passionate about it on both sides for sure. It's a little embarrassing that I ran significantly over-time with this interview, and my thanks goes to Nick and his handler for their grace in accommodating my questions. You can follow Nick on Twitter here. In fact, I recommend you should. He tweets funny things. BGM For Celestial Advice and All Bottled Up!